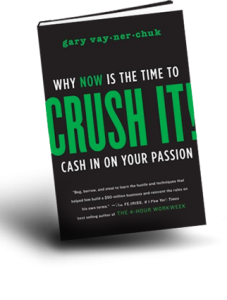 Internet entrepreneur and wine retailer extraordinaire Gary Vaynerchuk will talk about his new book CRUSH IT! Why NOW Is the Time to Cash In On Your Passion and sign copies in his only wine country appearance this fall, at V. Sattui Winery on Saturday, October 24. V. Sattui Winery is located at 1111 White Lane off Highway 29 just south of St. Helena. The book is published by HarperStudio and retails for $19.99. From 11:00 a.m. – 1:00 p.m. Gary will talk about the book, answer questions and sign copies for the public. The event is free and all are welcome. Copies of the book will be available for purchase at $19.99. A range of lunch/picnic options are available at a range of pricing, from bbq to pizza to sandwiches, cheeses, salads and more. In honor of Gary’s visit to Napa Valley, V. Sattui Winery will be making a donation to Robert Louis Stevenson Middle School in St. Helena.